During August/October I am visiting at the Technical University of Chemnitz to collaborate on the NanoSense Project which aims to develop a Multisensory Interface for exploring Collagen with an Atomic Force Microscope. At the Kickoff Meeting last Friday the group shared their research on nanoscale microscopy, collagen, auditory perception, sonification and haptics. Schematic illustration of the proposed multisensory interface. 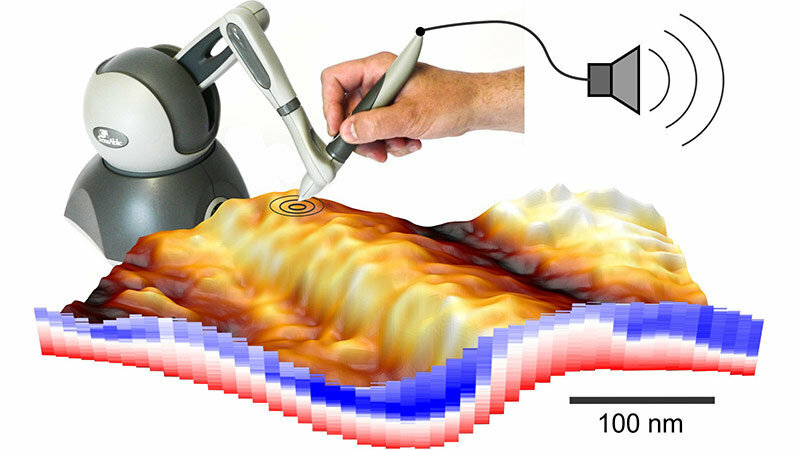 The example shows atomic force microscopy data for force vs. distance, measured on collagen fibrils within a thin section of sheep tendon (photo/graphics: Ro­bert Mager­le). With an atomic force microscope, the shape of a surface and its local mechanical properties can be measured in great detail on the nanometer scale. Understanding this complex and multidimensional data, however, is still in its infancy. Biological tissues in particular display a very complex spatial structure, and their mechanical properties remain largely unexplored on the nanometer scale. The same holds for individual atoms and molecules deposited on surfaces and the forces acting between them. In the case of such complex data, analytical methods based on statistical data reduction have reached their limits.